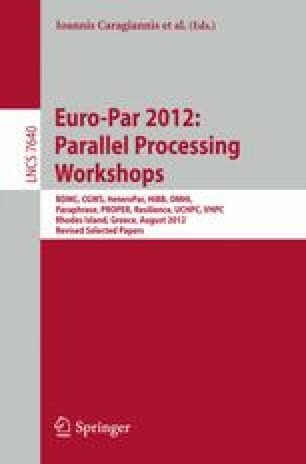 ParaPhrase (Parallel Patterns for Adaptive Heterogeneous Multicore Systems) is a three year FP7 EU funded project that started in October 20111. The project aims to develop and deploy new high-level design patterns for parallel applications that support alternative parallel implementations that can be initially mapped and subsequently dynamically re-mapped to the available heterogeneous (CPU+GPU) hardware. The ParaPhrase approach leverages a two-level (or ultimately multi-level) model of parallelism, where the implementations of parallel programs are expressed in terms of interacting components, and where components from different applications are collectively mapped to the available system resources.